If News is a good way to keep yourself updated on the latest topics on insurances and risk management. We send out approximately 10 newsletters annually. The articles are divided into different topics; In focus, Property, Liability, Marine Cargo, Motor and Personnel. Data protection is more than a compliance issue. Drone technology has developed fast during the last decade. Possibilities to utilize drones in insurance related fieldwork is becoming more versatile and cost efficient as technology develops and becomes commercially available. How do you protect yourself from terrorism? What do you need to do to meet your employer's obligations towards your employees both home and abroad? Is your company prepared for autonomous vehicles? Autonomous vehicles are coming. They will make traffic safer, less congested and cleaner. There will be more car and ride sharing, reduced labor costs in freight transport, and greater mobility and social participation among the disabled and elderly. 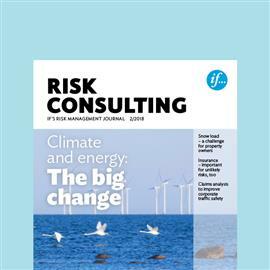 If's professional journal on risk management and loss prevention.